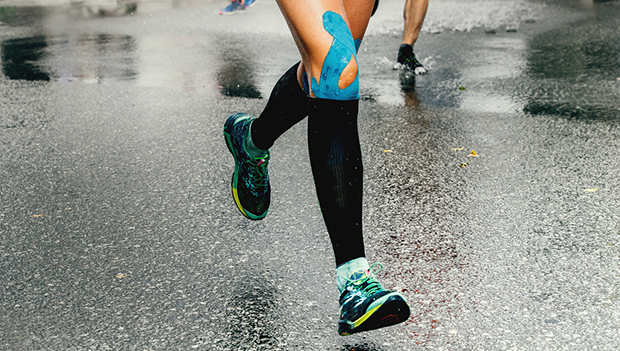 At nearly every race, you’re bound to see more than a few runners sporting kinesio tape—the thick, slightly stretchy, often brightly-colored sports tape arranged in dizzying patterns on ankles, knees and thighs. Some runners swear by it, while others swear at it. If you’re not established in either of these camps and are wondering what this product does and whether you could benefit from using it, read on to learn more. Kinesio tape, also called K tape or physio tape, is a thick, elastic, heat-activated sports tape that “acts as a kind of second skin,” according to Angie Groettem, a long-time runner and licensed physical therapist assistant for Physicians Diagnostic Rehabilitation in Burnsville, Minnesota. “It basically pulls the skin away from the fascia and increases circulation to that area,” Groettem explains. The product claims to help with over a dozen injuries, ranging from carpal tunnel to Achilles tendonitis to glute pain, according to the package specifications of a leading manufacturer. Amber George, of St. Paul, Minnesota, had a better experience. “I used it for shin splints before. I wrapped it compression-style, and it definitely helped.” But most of the other runners who told us they’d tried it said, more or less, that it might have made their injury feel a tiny bit better but that they couldn’t say for certain and that it was possibly just wishful thinking on their part. “It definitely depends on what you’re using it for,” Groettem says. “It’s much more effective as a support for smaller or more superficial areas.” In a sports application, Groettem has successfully used the tape for things like plantar fasciitis, to reduce swelling and speed healing from sprained ankles and as added foot or arch support. In her clinical work, she said the tape can be beneficial for patients suffering from lymphedema, chronic neck pain and more. “But it’s not going to be really effective on the deep tissue in those larger, more layered muscle groups, like a quad, for example.” In other words, results vary widely from person to person. So let’s say you’re suffering from plantar fasciitis, have genetically flat feet, turned an ankle ever so slightly or want to give an achy knee a little extra support. How do you actually put this stuff on? To find out, we had Groettem do a live demonstration, and everything she said was echoed in the instructions that came inside the package of tape we bought. To start, wash and dry the area you want to tape so you’ll get maximum adhesion. Then, with the backing still on the tape, loosely hold it over the injured area in the pattern you intend to use so that you can cut it to size. Once you have your strip of tape, peel an inch or two of the backing up from one end and apply it to the base of the area you’re taping. Press that end firmly as you stretch the rest of the tape up, down or around the injured area, rubbing it onto your skin as you go. The exact amount of stretch depends on the body part you’re taping (refer to package instructions or the manufacturer’s website), but Groettem recommended a range of 50- to 80-percent stretch. Then, as you reach the end of the tape, relax the stretch so the last inch or two are not under tension. Once the tape is in place, rub it vigorously for 20 to 30 seconds to heat it up. This helps the tape properly adhere and pull your skin away from the injured area. It should be noted that too much heat can be a dangerous thing. While it’s OK to wear the tape in the bathtub or shower (it is waterproof), very hot temperatures, like those in saunas, hot tubs and tanning beds should be avoided to prevent skin irritation or possible burns. For some joints, you may need to get a bit fancy, using two or three strips of tape or cutting part of a strip lengthwise to split it around an affected area. If you’re still unsure how to use it but want to give it a try, seek out an athletic trainer, sports doctor, orthopedist or physical therapist to give you a quick lesson. Although it varies from product to product, the tape should stay on and keep working for around two to three days. While the reviews on K tape are mixed—and the placebo effect may be its biggest benefit—at $10 to $15 per package it’s a relatively inexpensive recovery method to try. Remember, though, that even when it does work, kinesio tape is not a permanent solution. You’ll be much better served if you get to the root cause of your injury and take proactive measures to prevent it from happening again or getting worse.